Horse racing is a sport which is perhaps many centuries old and according to some historical figures, it could more than 2000 years old. It has been around since the Roman Empire age, and today there is no denying the fact that it is a multi-billion-pound business having a presence throughout the country. It also is quite popular across many countries of the world. As far as the United Kingdom is concerned, there is no doubt that there are quite a few racing centers and there are also reasons to believe that Nottingham is a place where some of the best races are held. It would be pertinent to mention here that the Nottingham Racing Course is the cynosure of all eyes and it has some of the best horses taking part. Hence, it would not be a bad idea to have a closer look at the various races which take place in Nottingham. 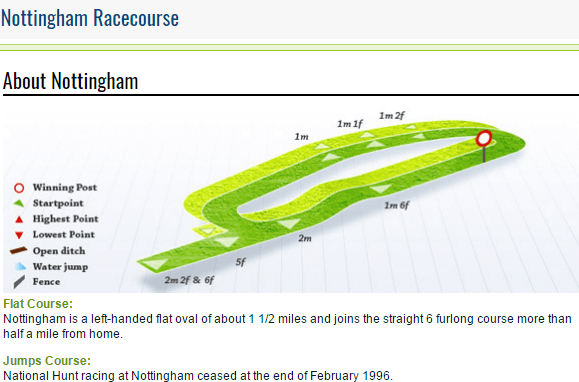 It would be pertinent to mention here that the Nottingham Horse Racing course is situated in Nottinghamshire in England. It is located exactly at Colwick Park and is very close to the Trent River and about 3 KM east of city center. It has two courses inside, and both are situated one inside the other. It is exactly 1 ½ miles in total length and it round. The inner course is used during autumn and spring. It has 5-furlong total length. The outer course is around 6 furlongs in length and is suitable for winter and rainy seasons. The racecourse has been in operation since 1773, and since then it has seen some of the best most amazing races as far as the United Kingdom racing history is concerned. Hence, it would be interesting to know more about the upcoming races as far as the Nottingham is concerned. To begin with, it is important to have a reasonably good idea about the various horse racing fixtures across the entire season. This will help bettors and punters to do their homework better and plan their strategy accordingly. It has to be borne in mind that there are many bookmakers who attach a lot of importance to the various Nottingham horse racing events. Hence, as a punter, you must be sure that you have a clear idea about the various races that have been scheduled. You also must spend time finding out more about the form of the various horses, the jockeys who are handling them, the form of the horses in general and in the Nottingham horse racing events. You must also have some idea about the owners and trainers which could also go a long way in getting to understand about the pedigree and form of the horses. Unless these are known, it would not be possible to make the right prediction. It would be pertinent to mention here that the first race is scheduled for 12th April 2017 and the events will open at around 12.20 pm and the last race will happen at around 17.20 hours. Though it may not be possible to have a close look at all the horses that are taking part, it is quite likely that we could take some cue from the previous year’s events and come out with a suitable prediction of the various events. The year 2016 saw wonderful horses taking part. What it ended with Further Flight Stakes was one of the most famous and prominent horses, and the winner was Frosty Berry, jockeyed by Shane Grey and trained by Ed del Giles. It won with an attractive timing of 3:31:53 minutes which was quite encouraging. Then we had the highly famous Kilvington Fillies Stakes. The winner in this race was Ridge Ranger. The jockey who ran the race was Jason Hart, and it was trained by Eric Alston. It won total prize money of £1,160,750 which was quite good. The month of June saw the great Nottinghamshire Oaks being held in Nottinghamshire and it is worth mentioning more about this race. It had the same prize money of the previous two races as mentioned above. There is no doubt that it was an exciting race with some of the most well-known and dashing horses participating. The event was by Elbereth, and it was run with the help of the jockey Oisin Murphy and trained by Andrew Balding. The timing was an impressive 2:11:99 minutes. It is one of the most exciting races as far as last years’ events in Nottingham Horse Racing history are concerned. There is no doubt that though there is money to be made as far as horse racing in Nottingham is concerned; one needs to get the right information. Hence, it would always be advisable to take as much information as possible from various sources. There are many bookmakers who can help you in this regard, and it would be worthwhile to take as many inputs from them as possible. There is no doubt that there are a few renowned bookmakers like Ladbrokes and Paddy Power. You must spend some time looking them up and getting information on the right odds which are being offered by them. They offer the odds based on individual races and consider the participants in such races. They also consider various inputs from other bookies and then come out with the best odds. Following them in conjunction with other inputs like the track record of the horses, the jockeys in question and other such vital information will also be quite useful, to say the least. Hence, you must spare no effort to try and gather as much information so that you remain always updated in this regard. It will help you to choose the right betting amount and ensure that you get back home with money often.